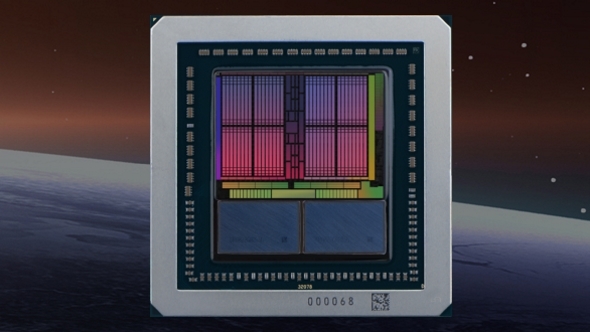 A fresh leak claims to show the gaming variant of the AMD Vega graphics architecture performing 15% quicker than a GTX 1080, but still well off the pace of a GTX 1080 Ti. Until the RX Vega cards are released these represent our pick of the best graphics cards you can actually buy today. 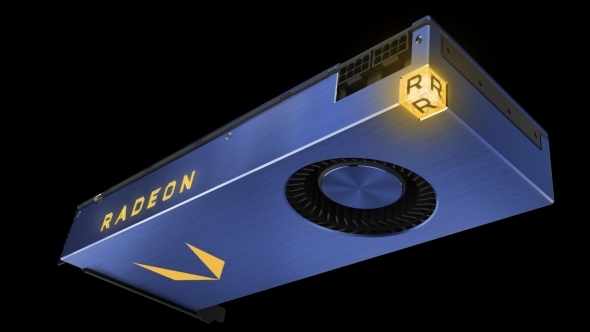 Yeah, so now we’ve seen some independent benchmarks of the only officially released AMD Vega GPU, the Radeon Vega Frontier Edition, we’re back to sifting through leaked graphics performance of unreleased cards. 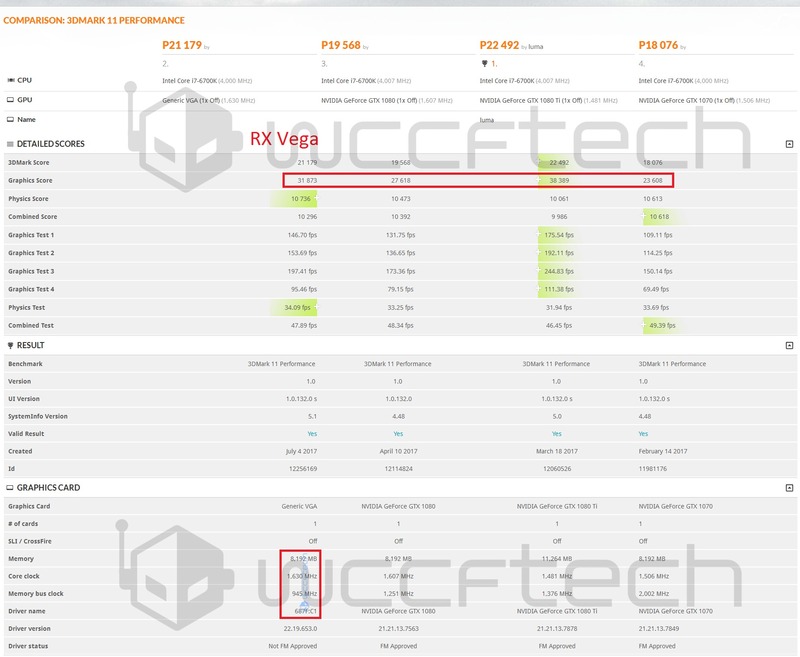 This latest leak shows what is expected to be the top-end RX Vega card, using the same device ID we’ve seen on previous AMD demonstrations – 687F:C1. The test was carried out with the old 3DMark 11 benchmark and claims to show how the gaming Vega variant compares with both the Nvidia competition. The RX Vega scores 31,873 in the 3DMark 11 graphics stakes, compared with 27,618 for the GTX 1080 and 38,389 for the GTX 1080 Ti. It’s a more favourable result than we saw with the Frontier Edition gaming tests, where the pro-level card was sitting between GTX 1070 and GTX 1080 levels, so it’s possible we’re looking at the engineering RX Vega actually using the correct drivers. The Frontier Edition currently doesn’t have software optimised for gaming workloads which goes some way to explaining its poor showing in the benchmarks. The RX Vega here is shown beating the GTX 1080 by around 15%, which is a great result and certainly more heartening than what we’ve seen from the FE. It’s still not close to GTX 1080 Ti performance, but nothing we’ve seen or heard since Vega was announced has made us think it’s going to be able to match Nvidia’s top GPU. The RX Vega configuration reported by the 3DMark 11 test shows a GPU using 8GB HBM2 and running at a core speed of 1,630MHz. That’s only 30MHz more than the Vega FE card, so it looks like it is those improved drivers are making up the performance shortfall. AMD either made a mistake launching Vega’s FE first… or they had no choice. With the RX Vega looking like it’s going to perform that much quicker than the recently released Vega Frontier Edition I’m still questioning why AMD decided to launch the slower pro card as the poster child for the Vega GPU generation. They could have avoided all of the performance anxiety which has surrounded the FE’s gaming performance if that had come after the RX Vega variants.